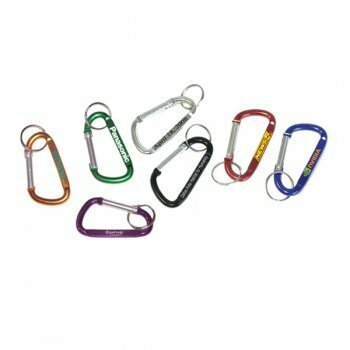 Custom carabiner with split key ring propels your brand towards success with its high utility value. This carabineer with key ring can easily clip your business information over bags, pockets, bagpacks and still remain affordable to you. Marketers working in all budget sizes can avail it for value building because it is offered in assortment of bright colors and people find them impressive. Attractive value savings can be availed on bulk orders of this customized carabineer with split keyring. 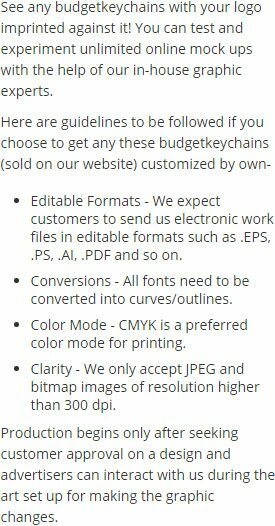 Request a quote to find discounts offered on customized carabineer with split key ring. Features – Solid aluminum construction in metallic finish with split keyring. Carabineer size 6 cm. Product Size – 2 3/8" x 1 7/32"
Available colors – Metallic Black, Metallic Blue, Metallic Gold, Metallic Green, Metallic Orange, Metallic Pink, Metallic Purple, Metallic Red, Metallic Silver, Metallic Yellow. Imprint Area :1 1/4" x 5/32"
Product Size : 2 3/8" x 1 7/32"